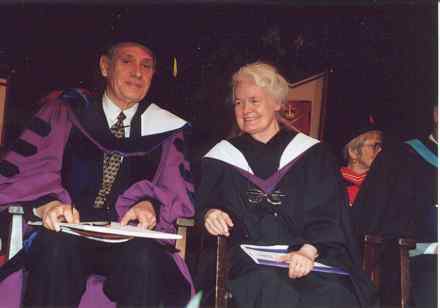 In 1986 I was awarded a summer residency at the Layton Artists' Colony in Banff, Alberta, to work on my Bartók-Brancusi project. 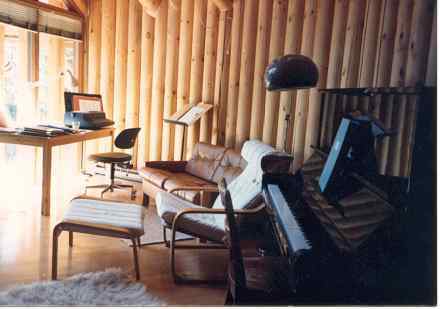 In the forest, eight cabins, each one designed by a prominent Canadian architect, offered to musicians, painters, writers, photographers and other artists, seclusion, silence, necessary equipment (in mine, a piano) and, from the large window, inspiration - the Rockies, the forest, passing deer, the white nights in June. 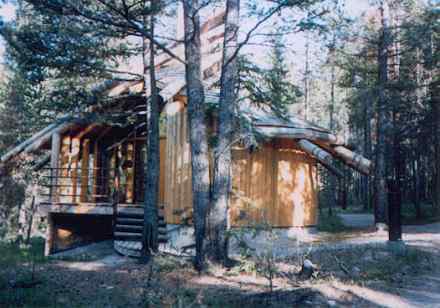 My cabin, the Cardinal Studio, had been designed by Douglas Cardinal, celebrated Canadian/Native architect “with an international reputation for excellence in natural design.” The form of the cabin echoed that of a nautilus shell, and also of a teepee; it was built with cedar logs in Cardinal’s “curvilinear, organic, indigenous Canadian style of architecture.” It was a miniature of what I admired years later near Ottawa (in Hull, Quebec), his extraordinary Canadian Museum of Civilization.